I hope your day has been as good as mine. I even took time out to take a long walk with a friend. Yes, I too Yogi with me. He loves walking too. I have been practiceing coloring long hair, it turns out sometimes and this is one that I did like so I finished up making a card. The DSP is from recollections paper stack and this one is stack is so pretty. I printed her off with neenah white and colored her with copics. E11,00,000, 29,37.35, 33, V15, 17. N0, 02, R20, The white piece around her head is a cut I made in the sure cuts a lot program. The flowers were cut with the cartridge flower shoppe using recollections white textured card stock. The leaf is also from flower shoppe. The ribbon is satin whisper white. The butterfly border is a MS punch. I glittered the flowers and the heart. The sentiment is made with MS Word using the font Vavildi. I will enter this card into these challenges. Accessories - SU satin whisper white, cricut, cartridge flower shoppe, MS butterfly border punch, glitter. Thank you all so much for stopping by, happy creating! Beautiful card and image! I love that butterfly trim. So pretty! Thank you for joining us for the Clear It Out Challenge! 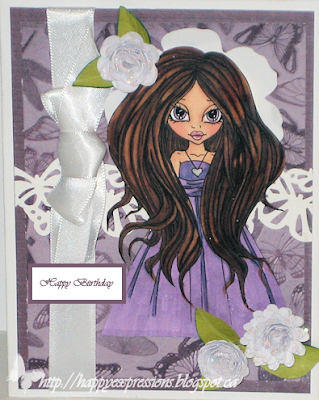 Love your card and beautiful image and colours. Thanks for joining us at Crafty Sentiments. Love this card, gorgeous image and colour. Lovely creation! Thank you for sharing this creation at Clear It Out Challenges! Wau-tosi kaunis kortti ja kauniit kukkaset! Kiitos osallistumisesta A and T Emerald Faeries - Flowers-haasteeseen tällä viikolla -toivottavasti näemme taas töitäsi ensi viikolla ! Gorgeous colours and I love how you've coloured her hair, thanks for joining us at Crafty Sentiments this week. Thank you for sharing @ Digital Tuesday! What a cute card! Thanks for joining us at the Clear It Out Challenge Blog. Good luck!